Are you struggling and feeling overwhelmed, stressed and anxious? Maybe you’ve had a difficult event or series of events and you’d like help to overcome them? Maybe you’re fearful or scared of something specific? Maybe you’re just plain fed up with life and feel in despair and would like to get out of the rut you are in? Maybe certain people, places or situations you clam up and would like to feel different? Maybe you’ve had a difficult birth or other perinatal experience (fertility, loss, breastfeeding, neonatal unit etc) that you’d like to move on from? “I went to see Tricia as I was suffering from a horrible anxiety and my friend recommended EFT. I admit I wasn’t convinced after reading the information but I thought I’d give a go. Tricia put me at ease immediately and we worked through some of things that were making me feel edgy. Within moments of starting the tapping technique I was calmer and the session was hugely beneficial. I’ve never know something to work so well so quickly and two weeks later I still feel great, I would highly recommend giving EFT a try”. EFT is a tool that can quickly change your everyday life. It’s a talking therapy which taps on a series of points around our body (like acupuncture/acupressure) and identifies the root of our worries/fears/anxieties and stresses by working with how our body reacts to a specific trigger. Consider how you feel before a big event or job interview – does your heart race, do you feel light headed, sweaty palms, nausea – that is your body’s reaction to a trigger. (That’s a tiny simple example – well actually not simple but something you can relate to!). With EFT we would work to identify that trigger, work out why your body responds in that way, release the intensity of emotion round it and then help you to break that connection so the body doesn’t react in that way. Once we have identified the trigger and the reaction, we can use EFT or other tools to reduce or in many cases, fully release the intensity around it and change the repetitive patterns and approaches. It’s a simple tool that anyone can learn to use. After becoming familiar with EFT for a number of issues and seeing how powerful it can be, I decided to train and use it to support women and men through fertility, pregnancy, birth and beyond. 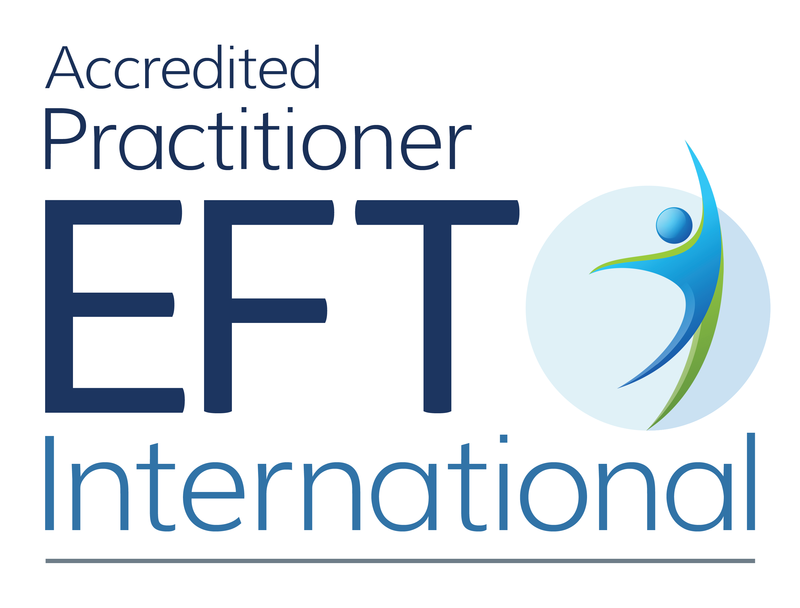 What I love about EFT is that it’s quick, it’s immediate and that for many a few sessions are enough – for some less, for others more depending on the complexity of their issue. Often clients come back with all sorts of different issues as they see the immediate and huge benefit. It can be used for any issues that causes you to feel fearful, anxious, stressed, worried, lacking confidence, not managing to achieve a resolution on repetitive behaviours, pain and much more. I’m particularly interested in using EFT as a way to support fertility, pregnancy, birth and early parenthood and help change people’s everyday life and mindset – fear to confidence, anxiety to calm, worried to relaxed, feeling relief post trauma. Unlike other interventions which can take time to change those patterns, EFT can have immediate effects by tapping into where the issue resides in your body and releasing it. It’s not counselling – we don’t spend too much time reflecting on the issue, we don’t need to know how you feel the way you do – we work entirely with how you are reacting to a trigger. Once we are aware of how your body works, we start to unhook those reactions and patterns and build new ones. It’s not a physical therapy where I touch you – you do your own tapping on various points round your body with statements we put together. As per any form of therapy, EFT is more effective in some people than others – it’s thought it works with around 80% of the population so there’s a great chance it will work with you but there’s never a guarantee (like many other therapies). Many people turn up cynical and walk away converted. The uniqueness of EFT is once you’ve learned how to “tap” and been supported to use it, you can use it everyday life – eg feeling anxious over writing an email, making a phonecall, meeting someone you’re not sure of, difficult conversations, stress with your family or children – every day small occurrences that can build stress in parts of our body. My experience is that many people who have struggle with other therapies find it REALLY effective. It’s also very good for people who overthink or go off on 5 billion tangents (like me) – it stops that and focuses them into the issue. What’s the point of going to see someone if I can use it on my own? When we work on our own issues (me included), we navigate ourselves safely through issues and don’t tackle what’s at the root/core because often we are so resistant to change or it’s too painful. You can probably use EFT for about 50-60% of your day to day issues, but for bigger issues such as pregnancy, birth or parenting – we need support through that. For being late to a meeting – you can absolutely use EFT on your own to help you feel calm about that. What’s the evidence around EFT? Studies have shown a comparison between CBT/Medication and EFT – the average number of sessions for treating anxiety with CBT/Medication is 15 (typical number of sessions between 9 and 20) whereas EFT the average is 3 (typical number of sessions between 1 and 7). There is still more research to be done to really evaluate it’s effectiveness given how new it is. However, as a therapy it’s gaining a massive momentum, becoming much more mainstream and that speaks volumes in itself. (Please note, that sometimes EFT will be used in COMBINATION with other tools that I use). It’s hard to know how many sessions you will need – depending on the complexity of your issue, it’s likely you will need between 3 and 7 sessions for your specific issue – some people need more, some people find one session is enough. And some still book in for a once a month session to let go of anything that’s coming up for them. The first session is 90 minutes long so we can go through what EFT is in more depth. We start off doing some practice tapping so that before we really get into your issue, you can get comfortable with EFT and can show you how effective it can be. We then start working on your issue. To book a session, contact me, briefly outlining what you want to get out of the session and I’ll get back to you by phone or email. Pingback: Is it really ok to not be ok?